This piece first appeared on Fabulush.com. See Amanda’s complete bio and contact info below the post. 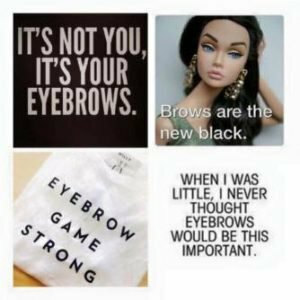 Trends have changed dramatically over the years, and while you can make an argument for natural-looking eyebrows personal preference, you can’t argue how dramatically your eyebrows impact and change your look. In the 80’s the trend emulated Brooke Shields’ thick, unkempt brows. It’s easy to understand why. Thick, lush brows are extremely eye-catching while their feathery appearance softens the face dramatically. Oh, but I was just a child in the 80’s…. Coming of make-up age in the 90’s meant that the term “Sharpie Eyebrows” was a thing and the only real winners during that decade were tweezer manufacturing companies. Sadly, I was not immune to the trend of the time and liberating myself of a unibrow quickly turned in to being extremely au courant and consequently, overplucked. By the grace of a fairly low pain tolerance and limited access to waxing salons I was spared the worst of the trend but my current situation isn’t exactly Brooketastic. 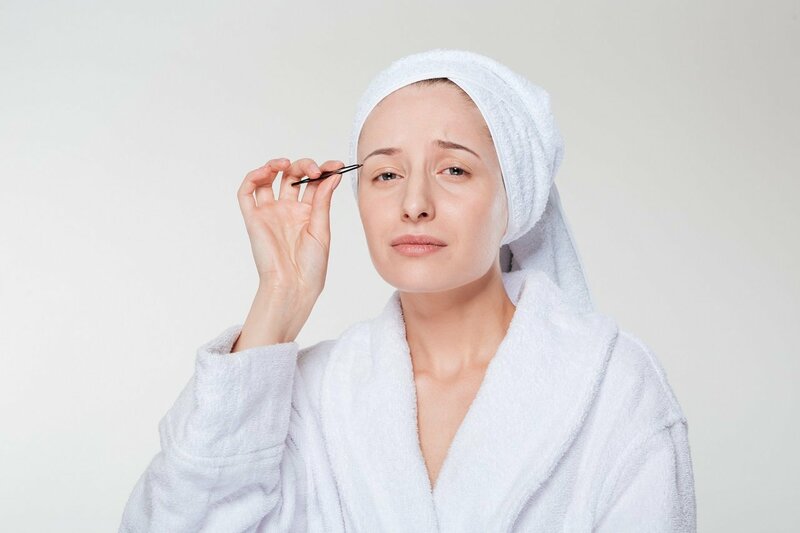 This time around, we are able to benefit from a couple of things that are extremely useful in the new age of thicker, fuller brows. There are one million and one amazing products ready and able to rescue us girls (and just as many truly awesome memes to amuse our slightly wounded egos). The tricky part is getting it right. Because frankly, the only thing worse than over-plucked brows is badly corrected over-plucked brows (read: step away from the stencil. No, really. PUT IT DOWN!). 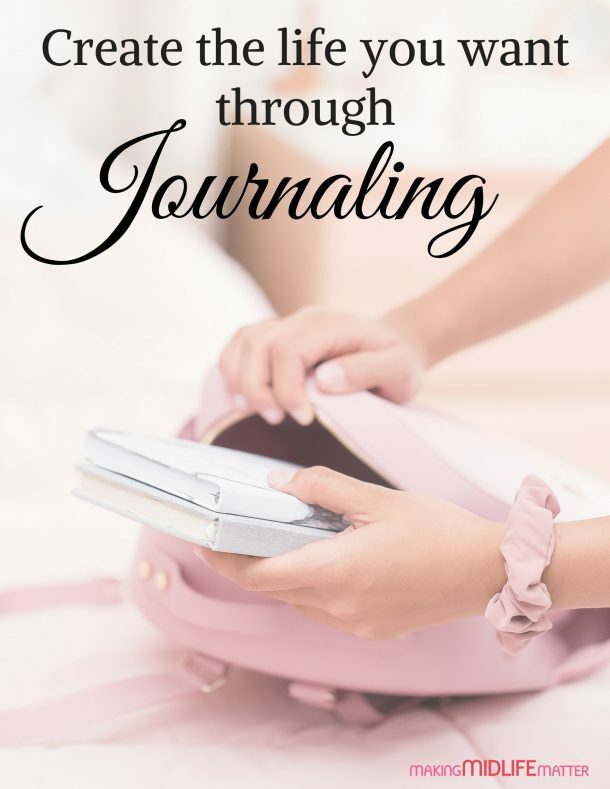 Through extensive trial and error, I have developed a very short product list of “must have” items that will give even the most amateur make-upper the ability to right the wrongs of your past quickly, easily and at a relatively low-cost. Before you go anywhere near your brows (or before you let anyone else, either) develop a plan. You need to know where you brow should start, end and peak. A quick web search can give you countless resources, but a basic one-size-fits-all guide can be found here. Don’t try to create the wheel and don’t try and force your brows into something they naturally are not. Follow your natural shape, just shape it up a bit. You’re perfect already – the goal is to enhance your face, not to make it someone else’s face. You will also benefit from making friends with a professional. Sure, you can do it yourself by painstakingly tweezing every single stray hair for the rest of your life. But it’s not very expensive to find someone who specializes in eyebrows. Let this person wax them on a semi-regular basis. Someone that knows what they are doing will truly save your face. Tools – Tweezers, brow scissors and a brow brush. 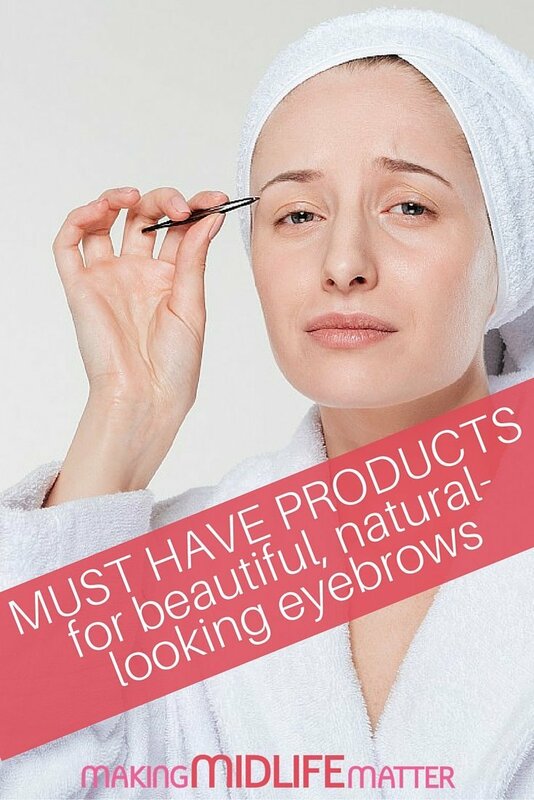 Yes, I realize that I’m discussing ways to enhance overplucked brows, but that doesn’t mean that you won’t get those goofy stray hairs that simply must go. It’s a safe bet that you will need to remove or tame some strays before your next professional service. Especially if it’s one of those ridiculous, rogue gray eye-brow hairs that point in the wrong direction and constantly mocks you until you defeat it by pulling it out at the root. Be judicious with the tweezers – you’re only looking for strays. Use the brush (I use a toothbrush, it’s the BEST for me) to brush the hairs straight up and trip the top with the scissors. A long, stray hair is very noticeable. Again, browproductsbe cautious and conservative – but straighten up that top line to keep things clean. My cosmetics list is pretty short and it’s all pictured below. You can spend a lot of money and grab tons of products – but it’s really not necessary.
. At $23.00, it’s definitely an investment, but it lasts a long time and I truly love it. It’s available in 8 shades, has a spoolie brush attached and makes quick work of defining. This pencil is my first step (sometimes my only step) in defining my brows and would definitely consider this product a “must have”. (available in 11 shades) but I find that it smudges quite a bit. It is easier for rookies to work with, but I’ll pony up the $29.00 for Tarte’s product any day of the week. OK, why? It’s more expensive, only comes in 8 shades and well, ABH is THE holy grail of eyebrow cosmetics… First of all, this product is $29.00 WITH the brush. And it’s a great brush (pictured above). It has a spoolie end and a liner end and the poor thing in the picture above has been my daily use tool for 2 years. It’s not a typical cosmetics-company throw away brush. It’s great. Also, the product in the picture above has been in my rotation for 2 years and I’ve barely made a dent. So yes, it’s expensive, but it’s a great value. It stays exactly where you put it, but blends beautifully without smudging. I use this product to thicken my entire brow, fill in sparse spots and, on special occasions, create major drama with a thick, defined sweep of color. Just talking about it makes me want to go do my brows.
. It’s only available in 4 shades, and I should have gone up a shade darker than I did, but at under $10 it’s hard to complain. This product has a very creamy texture and is very waxy, so with a quick swipe you can add color, fill in bare spots and set those unruly brows with ease. It’s far too thick to use for tight lines or strong definition, but that’s not what it’s claim is either. Perfect for beginners or those looking to simply fill in some sparse areas on well-groomed brows, this tiny little wonder packs a great punch. I have been lining with my brow pencil and using this to quickly sweep over the entire brow for some volume. The only two drawbacks are the lack of precision this product will give and the fact that it’s extremely smudgeable. 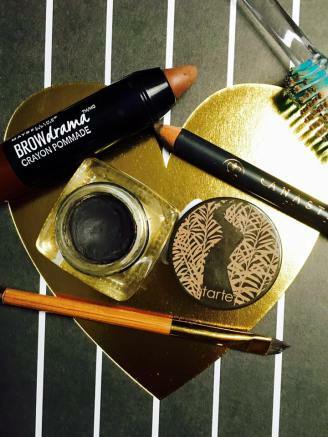 This is great for blending, and it’s easy to tidy up if you went a little nutty, but overall I consider this a drawback because I really don’t like the look of a dark shadow brow. but it leaves your brows crispy and crunchy. I think $22 is a little spendy for a look that I don’t care for. I mean, it would be awesome for my Oscar acceptance speech but since I can’t even get nominated for Leader of the Quarter at work, I’m thinking that’s not in the immediate future anyway. I prefer a simple trick that I’ve been using forever – it’s tried and true and costs almost nothing. I spray my eyebrow toothbrush (yes, I have a dedicated eyebrow toothbrush, I don’t multi task with one toothbrush!) with a fine mist of whatever hairspray happens to be in the rotation and swipe it over my brow – voila! Thanks for reading, lovelies! Please be sure to share your favorite brow products, tips and tricks with me because I’m always willing to try something new!